Broadly speaking, selecting a language can mean a couple of different things. First, it can mean specifying a language for the content that you are producing. However, it can also mean choosing a language for the Flare interface as you do your work. The broader the level where the language is set, the lower precedence it has in case of conflicts. In other words, the content level has precedence over everything. The topic level has precedence over the target and project levels. And the target level has precedence over the project level. 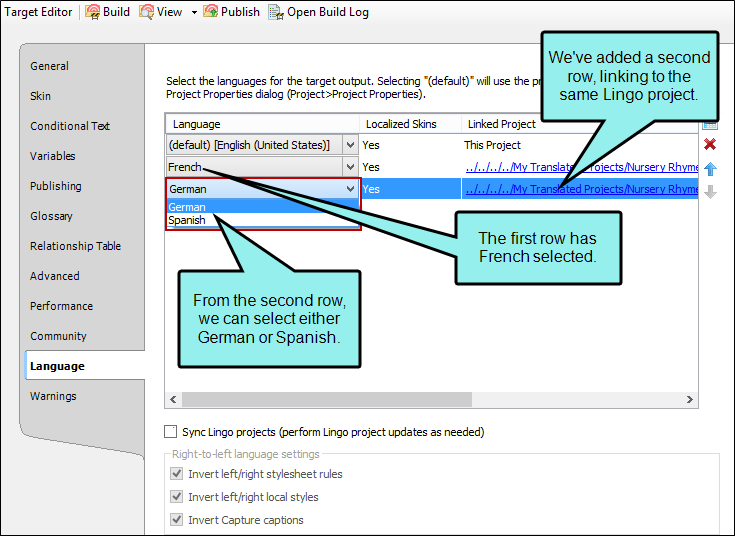 You can also set multiple languages at the target level, then link translated Flare projects to your current project. 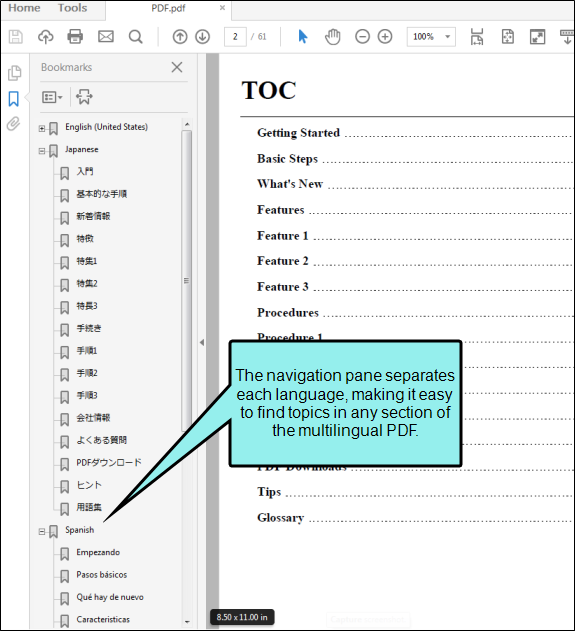 This allows you to create multilingual output. If you have not created the project yet, start a new project and select the language when you come to the appropriate page of the wizard. Otherwise, if the project already exists, continue with the next step. Ribbon Select the Project ribbon. In the Properties section select Project Properties. Keyboard Shortcut Press CTRL+SHIFT+P on the keyboard. The Project Properties dialog opens. From the list, select a language (those in bold font are supported in spell check). Click to save all files. In the Target Editor, select the Language tab. From the Language drop-down, you can change the language. Click . Another row is added to the grid. In the Linked Project column, click the link to select the Lingo or Flare project you want to link to your current project. Linking to a Lingo project allows you to skip the step in Lingo of exporting translated content out to additional Flare projects. If you have not added a linked project yet, the link will look like an ellipsis; if you have already added a linked project, the link will display the project's file name. Note: You can link to many separate Lingo projects, or you can link multiple rows in this tab to the same multilingual Lingo project, or you can do both. In the dialog that opens, find and select the project you want to link to your current project. Click Open. 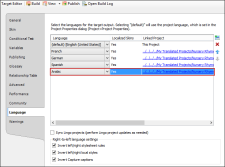 If necessary, select the linked project's language from the Language drop-down. Flare will automatically detect the linked project's default language settings, so you should only need to update this setting if you are pointing to a multilingual Lingo project or if it is incorrect in the linked project. Additionally, if default translations are available for the selected language’s skin, it will be noted in the Localized Skins column. If you have a custom language skin for the selected language in your linked project, Flare will automatically use your custom translations. See Creating User-defined Language Skins. Note: If you link to a multilingual Lingo project, only the remaining languages from a multilingual project can be chosen from the drop-down. In other words, if you've already selected one of the languages for a previous row, it is no longer available when you add more language rows. 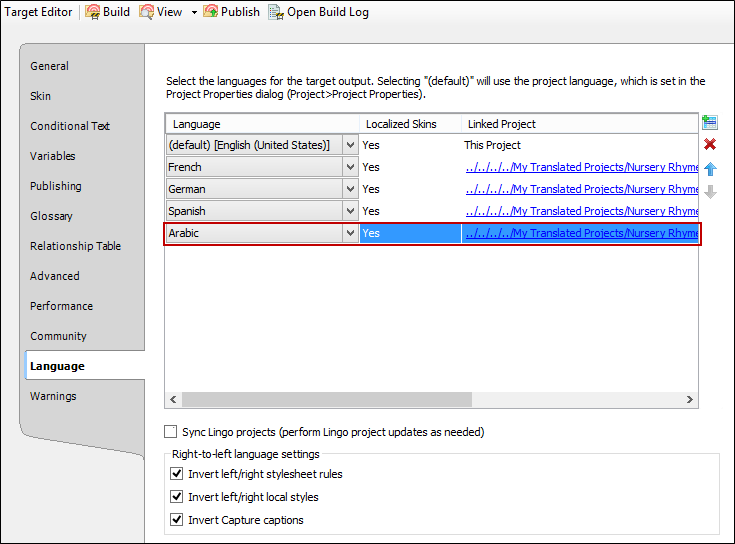 Note: The default target output language in the Target Editor always shows the currently selected project language. This language will update automatically if you change the project language. (Optional) Continue adding rows and linked projects for each additional target output language. (Optional) Use the and buttons to rearrange your projects. They will appear in your output in the order they are listed on the Language tab. (Optional) If you have added links to one or more Lingo projects, you can select Sync Lingo projects if you want to synchronize updates with those projects. If this option is enabled, the application detects whether any of the Lingo and Flare source files are out of sync. If they are, the Lingo project is automatically updated and these changes are also brought into the master Flare project. This is different from the usual process, where the translator would normally update the Lingo project manually and translate the changed or new files. Warning: You might use this feature if you want to quickly see any updated files in your master Flare project, including non-translated content such as images. However, enabling this option is typically not recommended, because there is always the risk of updating the Lingo project (and therefore also the master Flare project) with content that has not yet been translated. (Optional) If you selected a right-to-left (RTL) language, you may see the following options at the bottom, which are enabled by default for RTL languages. Leave them selected to automatically invert the following: (1) language-related style rules locally, (2) language-related style rules in the stylesheet, (3) image callouts from MadCap Capture, and (4) page layout settings. The options that are seen depend on which output type you are using. PDF/Word All four options are shown. HTML5/HTML Help/EPUB/Eclipse Help/WebHelp/WebHelp Plus Local styles, CSS styles, and image callout options are shown. DITA No options are shown. These options can be quite useful after you receive the project back from a translator. 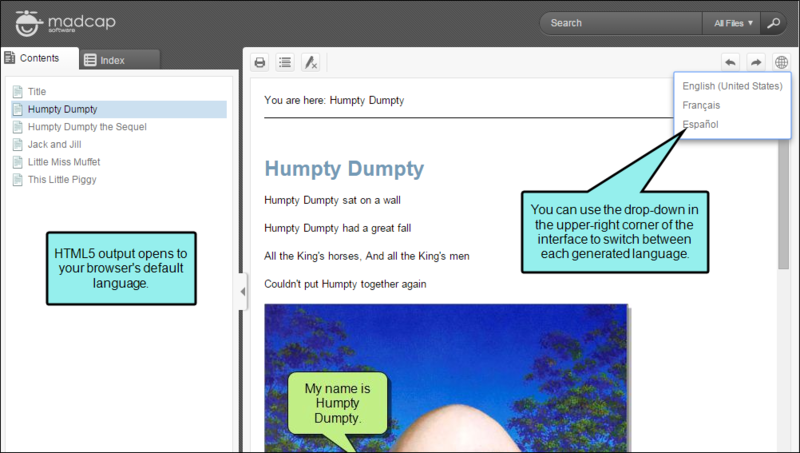 When you generate the output, the inversion of the styles and page layouts takes place. Let's say you have a project in English (a left-to-right language), and you need to have it translated into Arabic (a right-to-left language). For your p style, suppose you have a left margin of 5 px and a right margin of 30 px. Those settings work fine for your targets using the LTR language. But for the RTL language, you need the settings to be flipped so that the left margin is 30 px and the right margin is 5 px. So after you receive the project back from the translator, you make sure the RTL language in Flare is set at either the project or target level. As a result, the inversion options become selected automatically, and when you generate the output, paragraphs will have a left margin of 30 px and a right margin of 5 px. Note: The option to invert page layouts controls every aspect of the page layout file (e.g., it inverts not only frames and content within them, but also styles applied to frame content). The other invert options have no effect on page layouts. Note: If your selected language is LTR, these options cannot be accessed in the Target Editor. When you are ready to build your output, open the target you want to generate and click Build (see About Building and Publishing Output). Flare will generate the linked target from each project in the order you specified. The final files will be generated differently depending on the output you are generating. Flare will create a subfolder in your Output folder for each language. When you view the output, Flare will display the output for your browser's default language. 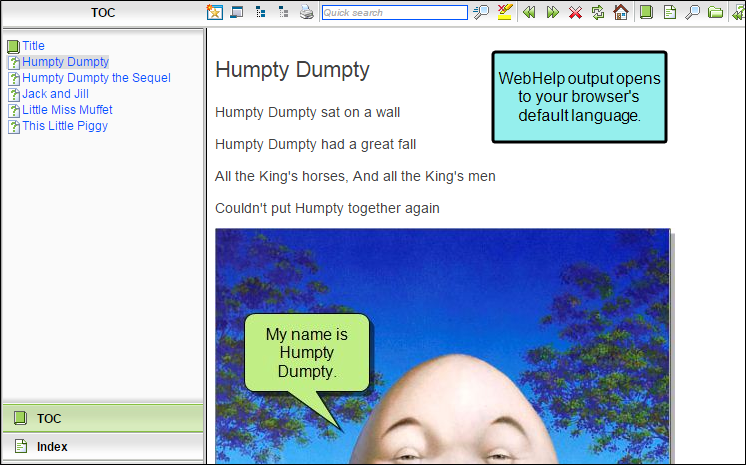 In HTML5 outputs, you can use a drop-down menu to switch between each generated language. HTML5 output will look like this. WebHelp output will look like this. Note: Be sure that the file names are the same in your master project and each of your linked projects. This is especially important for HTML5 targets, so you can switch between languages using the Select Language button in the output. Note: If you are using an HTML5 output, be sure to enable the Select Language button in the skin for your master project and each linked project. This will allow you to change languages using a drop-down. 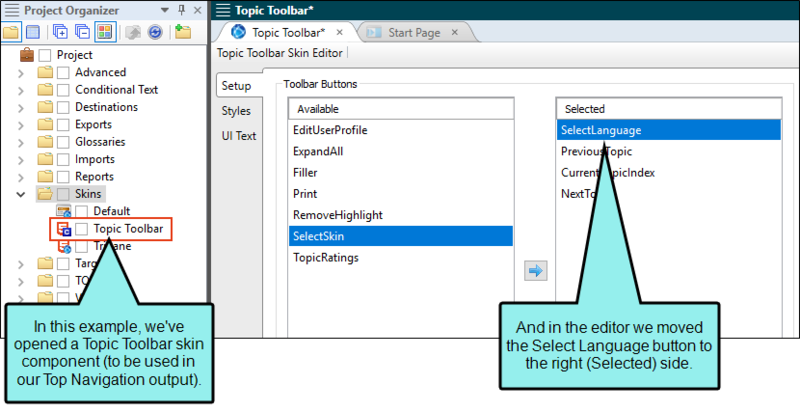 If you are creating Top Navigation output, you should have a Topic Toolbar skin component in your project (see Adding Skins and Topic Toolbars in HTML5 Skin Components). Open the skin component, and select the Setup tab. If instead you are creating Tripane output, open the regular skin and select the Toolbar tab. If necessary, move the Select Language button from the Available section to the Selected section. After you add the Select Language button to your Topic Toolbar, you also need to be sure the toolbar appears in your master page. If the topic toolbar does not appear in each of your master pages, you will not be able to switch languages from those page types. See Inserting and Editing a Topic Toolbar Proxy. The output is merged (or “stitched”) into a single document, with each language appearing in the order you specified. You will see a single file in your Output folder. PDF output will look like this. Note: Generating a PDF output using a multilingual target uses the same process as PDF stitching (see Stitching PDFs). However, creating a multilingual target automates the process and allows you to work from multiple Flare projects at once. 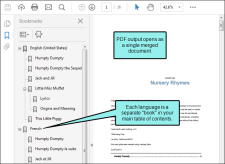 Additionally, because you do not need to generate each PDF separately every time the document is updated, generating output from a multilingual PDF target saves considerable time. 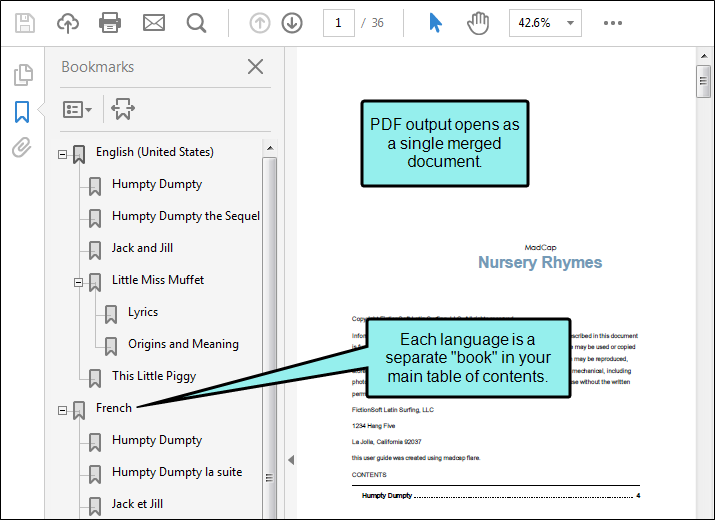 Note: You can access individual PDFs for each language in the Temporary folder in your Output folder. Flare will create subfolders for each language in your Output folder. 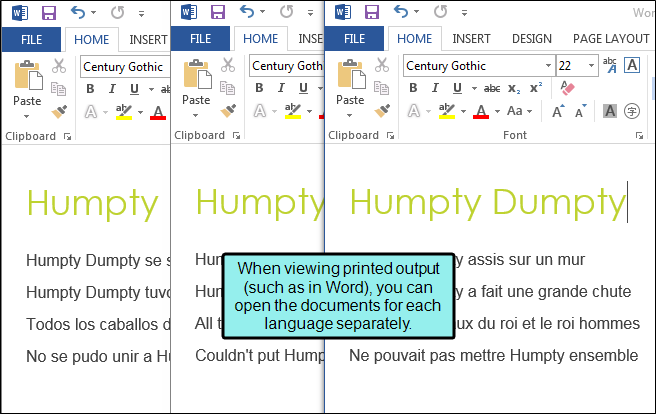 You can merge printed output types manually (e.g., in Word) if you need to create a single file. Word output will look like this. Note: If you are building Eclipse Help, you will need to open your Output folder to open your desired language output. Following are two examples of multilingual output. In the first example, a Flare target points to other Flare projects that have been translated. This example also illustrates the process of adding a button (via a skin) so end users can switch between languages in online output. It also shows how PDF output is generated from a multilingual project. In the second example, a Flare target points directly to Lingo projects. This is a more direct approach because it doesn't require the creation of additional Flare projects. Let’s say you want to create HTML5 and PDF outputs in US English, Spanish, and Japanese. You have already worked with a translator to translate your documents, so you have three different Flare projects: one for each language. Before you can create your multilingual output in Flare, make sure each Flare project has both an HTML5 and a PDF target available. This allows your master project to build from the targets in the other two linked projects. 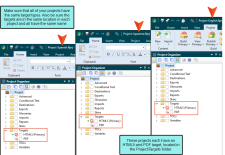 Open the Project Organizer in each project, and then open the Targets folder. If you already have the targets you need, you do not need to create any new ones. If you do not have both targets in all three projects, you can create the missing targets from the Add File dialog. See Adding Targets. Because you want to build multilingual HTML5 output, you need to make sure that each of your projects has the Select Language button in its HTML5 toolbar, and that you've added the Topic Toolbar proxy to a master page. If it the button isn't there, users won't be able to switch from one language to another in your output. See Topic Toolbars in HTML5 Skin Components. Open the Project Organizer. 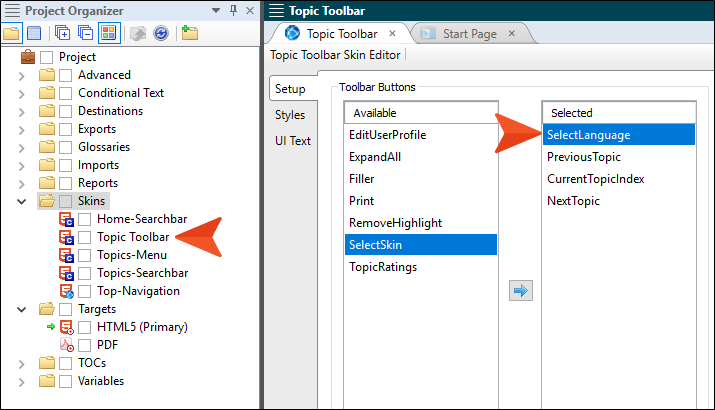 In the Skins folder, open the Topic Toolbar skin component. On the Setup tab, select the Select Language button, click to add it to your skin, and then save your work. Now you can prepare your multilingual target. Open your master project (in this case, the US English project), and open the Targets folder. Open the HTML5 target. In the Target Editor, select the Language tab. This is where you will link your other two projects. On the right side of the tab, click to add a new row. Click the link in the Linked Flare Project column. 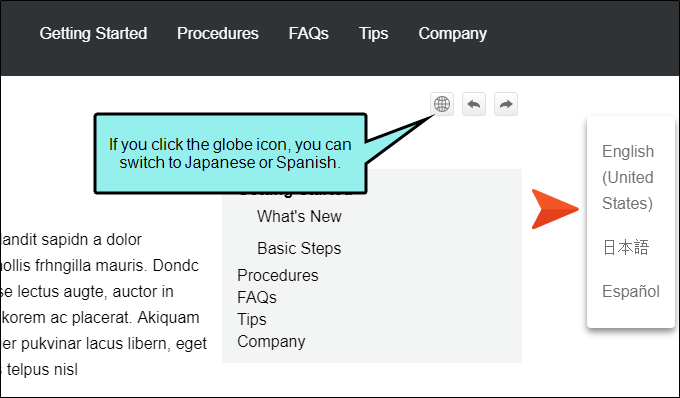 In the dialog that opens, navigate to your Spanish project and click Open. This links the Spanish project to the US English project. 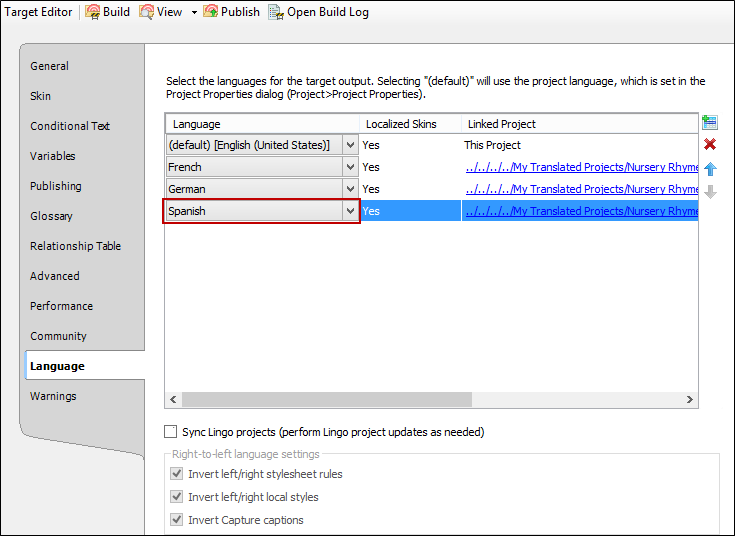 The Language drop-down automatically updates when Flare detects the default Spanish language settings in your linked project. Add your Japanese project in the same way. You want the Japanese project to appear second in the Help system, so you select the Japanese project and click to rearrange the projects. Now the Japanese project is listed before the Spanish project. You are ready to build, so save your work and build the target. When you open the HTML5 output, it defaults to the US English Help because that is your browser’s default setting. But remember the Select Language button you added to your Topic Toolbar skin component? You can use that button to change the language setting using a drop-down menu. The output will then display in Japanese. Next you create the PDF target. Open the PDF target in the Target Editor and create it in the same way you did the HTML5 output. Since you want the Japanese output to appear first, you add that project first, then you add the Spanish project. Save the PDF target and build it. When you look in the Output folder, you only see one document. This is because Flare stitched all three documents together into a single PDF. When you open the PDF, you see all three languages in the document’s table of contents. Each language has its own title page so you can find it quickly. Let's say want your Flare project to be translated into Arabic, French, German, and Spanish. You have one translator who knows French, German, and Spanish, and you have a second translator who knows Arabic. Because the first translator knows three languages, there is no reason to have multiple Lingo projects for each language. Instead, the translator adds all three languages to a single Lingo project and translates the files. Meanwhile, the second translator creates a second Lingo project and uses it to translate the Flare project into Arabic. Both translators keep their Lingo projects on a server where you have access them. When the translation work is finished, you open your target in Flare, and on the Language tab, you add a row for each language. In the first row, you link to the Lingo project that was used for the French, German, and Spanish translations. After you add the first row, you notice that you can select any of the three languages. For the first row, you select French. Then you add a second row. This time, you can only select German or Spanish (because French has already been used). For the second row, you choose German. Then you add a third row. Spanish is automatically chosen for that row, because it is the only one left. Finally, you create a fourth row and link it to the Lingo project used for the Arabic translation. 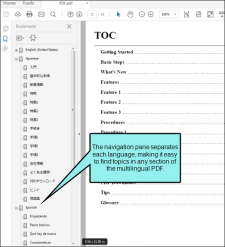 Note: You can use a tool like MadCap Lingo (or another computer-aided translation tool) to translate your Flare content. Although you can set the language for your project in Flare, this does not mean that Flare automatically outputs translated content. 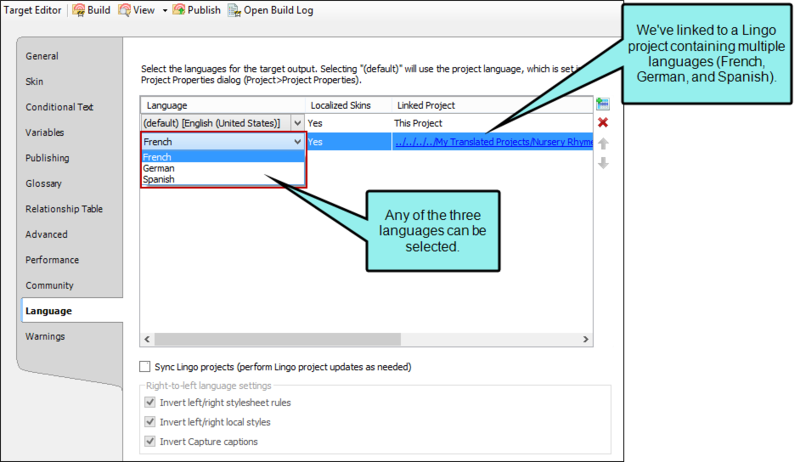 Note: You must link each language to a Flare or Lingo project before you can close the Target Editor. Similarly, if you make changes to your linked projects and their links are no longer valid when you build the project, you will see a warning message before the build starts and you will be unable to build. Note: In order to build output that links directly to multilingual Lingo projects, the Flare user must have at least Lingo 10 installed on the same computer. Note: When you build a target that is set up for multilingual output and you link directly to a Lingo project, the export process runs automatically in Lingo so that the master Flare project can grab the necessary translated Flare projects. If the Lingo export process encounters warnings, these will not display with the other build warnings in Flare's interface. Instead, you must open the build log to find any such warnings. Note: Because Flare generates output from the linked targets in each of your project files, each linked project must have its own target file for the output you want to build (e.g., if you are creating PDF output, each linked project needs its own PDF target). If you do not have a needed target file in one of your linked projects, you will see a warning message before the build starts and you will be unable to build. Target files must be in the same relative location in each project. Note: If you have created a new language skin for a language, Flare will use it when you build the project. The language skin must reside in the project that uses that language. See Creating User-defined Language Skins and Editing Language Skins. Note: If you are using right-to-left language settings in a linked project, you must enable these settings in your master project target. Language settings in the master project target control those for each of the linked projects, regardless of the settings in your linked projects. See How to Select Languages for a Specific Target. Open the topic or snippet. Highlight the content where you want to change the language. Select the Home ribbon. In the Attributes section select Language. The Select Language dialog opens. Select the language from the list (those in bold font are supported in spell check). You have the option of viewing the interface in English, French, German, Japanese, or Chinese. All of these languages are available from the same version of Flare (you do not need to purchase different versions for different languages). When you initially launch Flare, you are asked to select your language preference. Based on your selection, the user interface is displayed in the selected language, with the option to switch your preferences at any time from the Select UI Language dialog. If a particular element is not available in the selected language, that element displays in English. Launch Flare. The Select UI Language dialog opens. Select File > Options. The Options dialog opens. Click the check box Show Select UI Language Dialog on Startup. Select the language that you want to use from the drop-down list. (Optional) If you do not want the dialog to display when you launch Flare, click Show this dialog on startup to remove the check mark. If you later decide that you do want to see this dialog when launching Flare, open the Options dialog and click the box to open this dialog on startup. Click OK. Flare is displayed according to your language selections. Note: Using Flare's analysis tool, you can generate a language report. This report shows each file where a language tag is found, the content tag to which it has been applied (e.g., html, span), and the language used. See Viewing Used Language Tags. Note: Spell check is based on the language setting for the project, target, topic, or selected content. However, you can also set language-based spell check settings for a style in the Advanced view of the Stylesheet Editor by entering a language code in the mc-language property for a style or class. If necessary, you can edit the language skin, adjusting the text on the buttons and labels. See Editing Language Skins.